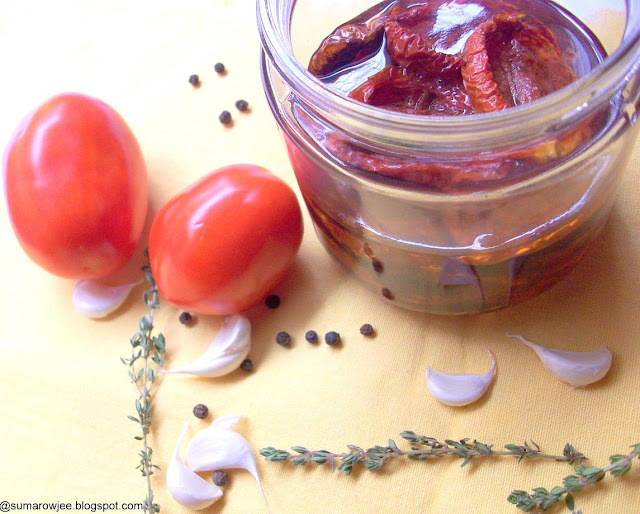 Tomato is a favorite fruit vegetable and I love using it in my cooking. So much so I find it difficult to cook certain dishes without it! 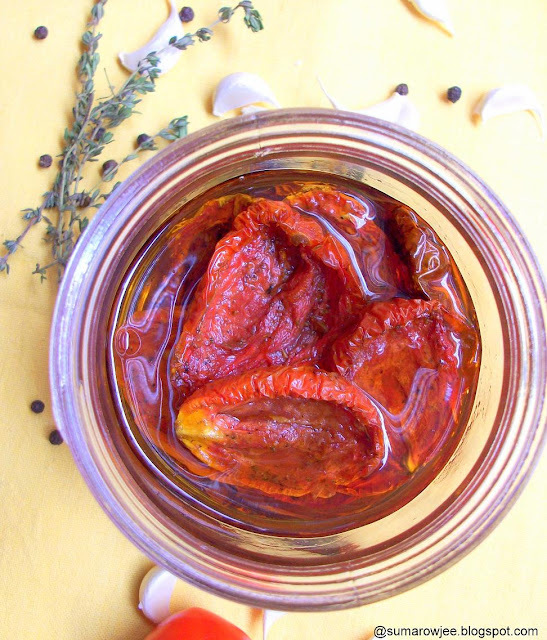 I have read about and seen sun dried tomatoes only in the past few years. I am sure I would have tasted it in some dish but obviously not enough for me to vividly recall the taste of it. Drying this luscious fruit with herbs and spices sounds yumm and I tried my hand at making oven dried tomatoes. You could use plum tomatoes as I have used or use cherry tomatoes in one or both colors. These are sliced, tossed in oil, salt and pepper and choice of seasoning and slow dried in the oven for several hours. You could use them immediately or preserve them in sterilized jars or in oil if intending to preserve them for longer. You could snack on them and watch the hours of effort disappear in a jiffy or use them in your pasta or salad or even as a topping on your tart or pizza or in your sandwich. 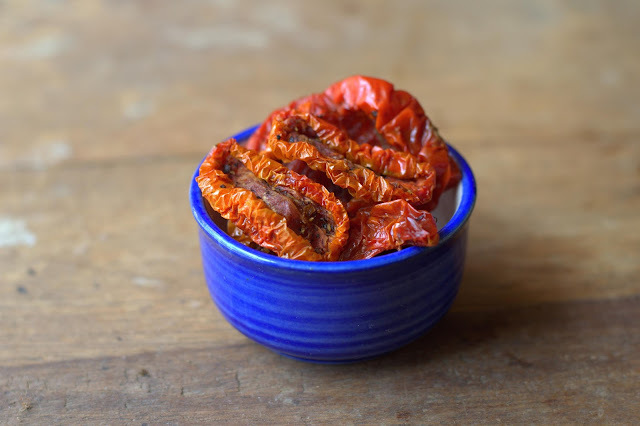 The method is pretty simple and there really is no right or wrong way of doing this really!Select some good quality ripe but firm tomatoes, preferably of the same size for uniform baking time. Wash and slice them into two, de-seed them by pushing the seeds out with your thumb. Toss them in oil, chopped or grated fresh garlic, herbs like oregano and thyme, salt, freshly ground pepper or red chilli flakes. Bake them in the oven pre-heated to a low setting - I set mine at 100 degrees C .
The baking time depends on the temperature you are baking at, the size of the tomatoes and the desired degree of dryness. I have baked them till shriveled and crisp at the edges, dry but still soft at the centers ( as opposed to not juicy). Your dried tomatoes will have a concentrated tomato flavor along with the flavors of the oil, herbs and spices you have used. Think slightly aged very chunky tomato pickle! This is what I have used, I have baked in both my ovens. Recipe adapted from various similar recipes. About 3/4 cup more oil if you wish to preserve them in oil. Feel free to use as much herbs and seasoning as you wish, but do bear in mind that the tomatoes will shrink a lot and the flavor will be concentrated. Unless you plan to use these as a snack, its better to err on the side of less seasoning as the dish you would be using these in will have more flavors as well. If you find them low on seasoning, its just a matter of sprinkling some on top to eat as is. Pre-heat oven to the lowest setting , mine at 100 degree C. Line your baking sheet or tin with parchment. Toss the sliced tomatoes in the oil and seasoning. Place them cut side up on the lined sheet. Bake till the tomatoes are almost crisp and shriveled at the edges, dry but still soft in the center. If you press the center firmly with your index finger, it must not feel juicy. It should feel dry but still soft, like a raisin. If you bake it even longer the tomatoes may become rubbery. Some of my tomatoes baked in 3.5 hours, I baked some for almost 5 hours. You could start checking at around 3 hours. Take out the slices which feel done, leave the others to bake longer. Bake some slices for different lengths of time to figure out what texture you will like best the next time you bake these. Remove the slices from the oven, cool and store in the refrigerator for a couple of days. Store in sterilized jars or in oil if you wish to store them longer. This looks so good Suma...must try this out soon ! 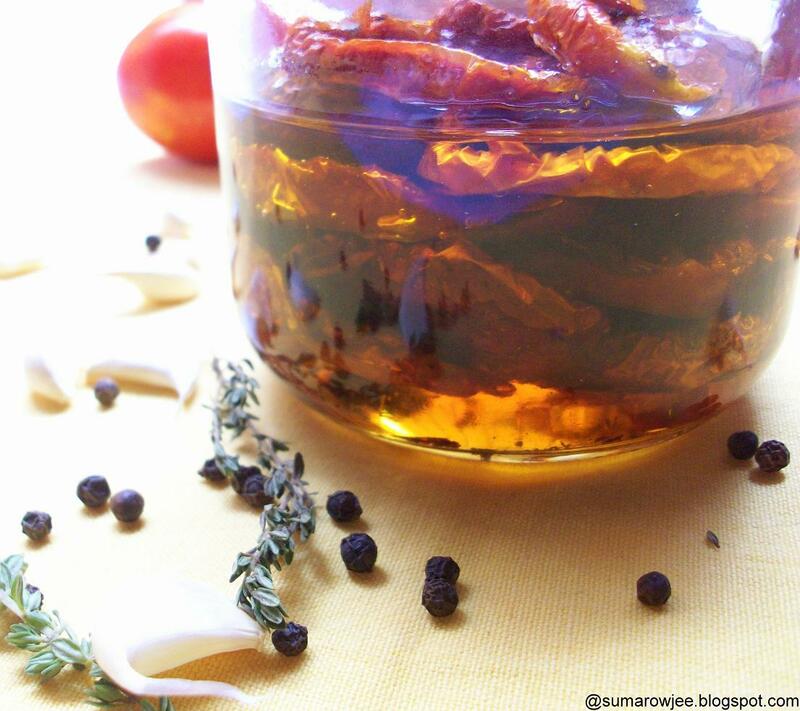 We get very easily sun dried tomatoes preserved in bottle,thats y never thought to make them at home. Your oven dried tomatoes sounds truly interesting and pulling me to give a try. @Pratibha - I baked some in the OTG and some in my microwave as I was baking 1 kg tomatoes..do try it! 3.5 to 5 hrs of baking ??? I am fainting Suma. I am happy to sacrifice my love for sun-dried tomatoes if I had to do this! Appreciate your energy and patience. Take a bow... Hatsoff to u!! !